Barns, stabling, farm storage, workshops, garaging, milking, kennels - farms always need lots of buildings and for many farmers modern steel buildings provide the space and flexibility without breaking the bank. And as farming needs develop and machines and businesses change many farms find they need to replace old outbuildings and barns and install newer higher specification buildings in their place. One of the fastest and most cost-effective buildings available are steel-framed steel buildings. 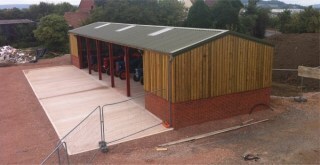 Though often thought of as just steel sheds, in practice steel buildings come a wide variety of forms and formats. A basic steel frame holds the building and can be designed to fit into whatever space you have, but then there are a huge number of options for cladding, windows, skylights, internal arrangements, doors and access. Though many steel buildings are clad in organically-coated steel for top weather-resistance, a steel framed building can be finished off in brick or stone if needs be to ensure it stay in keeping with the farm. The great benefit to farms is the flexibility of the space. The portal-frame design means all the interior space is available for use - there are no interior walls or pillars supporting the structure. The outer walls are also not weight bearing allowing for windows, extra large doors or just open sides for ventilation as required. Steel buildings are common on most farms and can include everything from small sheds to luxury riding arenas, to self-install steel building kits. Get advice, help and quotes for farm buildings from suppliers across the UK. Click the Quote Me button below to get started! Simple is sometimes the best. This is a plain steel barn finished in green steel cladding used on a farm for storage.